Slickdeals News & Articles Buying Guide Which Music Streaming Service Offers the Best Quality and Value? We tried six music services to see which ones hit the high notes and which ones fell flat. When it comes to listening to music these days, it's hard to beat the ease, selection and affordability of streaming services. But with a large variety of choices available, it's not always immediately apparent which one(s) will be worth your time — and money. In an attempt to find out which music streaming services offered the best quality and value, I tried out six of the most influential products available right now: Apple Music, Spotify, Amazon Music Unlimited, TIDAL, SoundCloud, and Pandora. Pros: While Apple Music started off a little buggy back in 2015, things have really improved since then. The service now prides itself on having exclusive release deals on popular new albums, which means users won't have to wait to hear the latest tracks from their favorite artists. Another strong feature is its very user-friendly platform, second only to Spotify in my opinion. Apple Music also integrates well with all of your other Apple tools, like iTunes and Apple CarPlay, and, of course, you can use Siri to help you navigate your music hands-free. It's hard to beat the ease of integration here if you're an Apple fanatic. The service also has a 24/7 live radio feature called Beats 1, which has DJs who not only play interesting new music, but also talk shop about what’s going on in the industry. Cons: Apple Music doesn't have the best algorithm for discovering new music, and its playlists don't provide the best experience either. If you're looking for a service that will broaden your horizons, Apple Music will probably let you down. Price: Free 3-month trial. $4.99/month for students, $9.99/month for individuals or $14.99/month for a family plan with up to six people. Alternatively, you can now pay $99 upfront for an annual individual plan. Pros: Spotify has one of the most user-friendly app interfaces I have ever experienced. Additionally, the playlists on Spotify are extremely diverse. When I was trying to discover new music with Spotify, the app actually surfaced new music that fit my tastes. Also, the way it builds playlists is unique, from New Music Friday playlists to Discover Weekly tracks, every song feels authentically curated. It also encourages users to create and share their own playlists with friends. One of the coolest features is Spotify Running, which plays music that matches your running tempo to keep you motivated. Cons: While there's a free Spotify option, it allows for only limited control over what you listen to next on the mobile app, plus there are ads. Another downside is that Spotify no longer has its own lyrics feature. There are other apps available to help with that, but obviously, they add a step to the lyric-finding process. Price: Free for ad-supported listening and shuffle-only play on mobile devices. $9.99/month for an individual Spotify Premium plan or $14.99/month for a family plan with up to 5 people. Students receive a 50% discount on individual subscriptions. Pros: Amazon Unlimited has a user-friendly interface, although its navigation takes some getting used to. If you have any music on iTunes, the app automatically prompts you to import your library so that you can listen to all your music in one place. Additionally, Amazon's Alexa is integrated into the app, and you can ask her to play a song from a particular snippet of lyrics, specific artists, playlists, songs and albums, all hands-free. Lastly, Amazon offers an enticing feature called Side-by-Side, in which iconic artists comment on selected tracks from their albums. Cons: There's nothing all that exceptional about Amazon Music Unlimited, and you can simply get so much more out of the other options on the market. Plus, Prime members can get Prime Music free with the cost of membership, so the additional cost of Unlimited just gets you a few more songs. OK, it's actually more like tens of millions of songs as opposed to the two million already available on Prime Music, but it's hard to justify the paid addition of songs you probably will never listen to. Price: $3.99/month if you have an Amazon Echo, Echo Dot or Amazon Tap device; $7.99/month for Prime Members; $9.99/month for non-Prime members; $14.99/month for a family plan with up to six people. Pros: The most prominent benefit of TIDAL, which is Jay Z's answer to the standard music quality of other streaming services, is the premier sound offered through their lossless high-fidelity feature called TIDAL HiFi. With the right speakers or headphones, it's like being at a concert. Audiophiles looking for the best possible sound will definitely appreciate this service. Beyond that, if you want to find new music and support new artists at the same time, there is a feature called TIDAL Rising, which helps you find new bands and musicians trying to expand their audience. Of course, if you're a Beyoncé fan, TIDAL is the only place to stream her album "Lemonade" as it isn’t available on any other on-demand music service. Cons: Although TIDAL is beautiful in design, it can be confusing to use. I had to put my Google hat on to actually find out how to easily save songs offline. Organizing a playlist by an artist was also difficult. Apple Music and Spotify both make it significantly easier to sort and organize your music. Lastly, while the HiFi option is legit and a unique experience, it also costs $19.99 a month, which could be hard to justify for many consumers. Price: For students: $9.99/month for TIDAL HiFi or $5.99/month for the standard TIDAL Premium. For military members: $11.99/month for HiFi and $5.99/month for TIDAL Premium. For a family plan: $29.99/month for TIDAL HiFi, $14.99/month for TIDAL Premium. For everyone else: $19.99/month for TIDAL HiFi, $9.99/month for TIDAL Premium. Pros: SoundCloud is an interesting music service because anyone can upload their own original tracks or remixes and share them via social media or the app. Finding new and non-corporate music is the biggest positive here. You can discover artists through hashtags or search through what others are listening to. SoundCloud has really perfected the community and engagement aspects of its service. You can even see comments from users on specific parts of songs. This is a good option if you like to experience music with others since SoundCloud allows you to Like, Retweet, and share on both your own SoundCloud account and most other social media platforms. Cons: The platform was sometimes glitchy, and skipping forward in a song was difficult when I had my phone locked. Additionally, if you don’t have the premium version of SoundCloud, called SoundCloud Pro, you'll mostly only have access to a random selection of songs from artists — rather than a full catalog — since most of the uploads are provided by users, and not offered in any sort of organized fashion. Exclusives aren’t really a thing either on SoundCloud, so if you want the latest releases from big artists, you'd be out of luck. Price: For SoundCloud Pro: $7/month or $63/year. For SoundCloud Pro Unlimited: $15/month or $135/year. Pros: Pandora was one of the first big names in streaming music, and it's gone through some major overhauls in recent years. The upgraded user interface is definitely comparable to Spotify or TIDAL in terms of design aesthetics. Toggling from Pandora's library of music to offline downloaded songs is extremely easy, even more so than on Spotify. Pandora also features an easily accessible “My Thumbs Up' playlist, something I wish the other services also had. I can’t tell you how often I've "thumbs up’ed" songs on Apple Music only to never see or hear that song again. Cons: Pandora lacks a lot of the big-name artists that most of the other platforms thrive on. It also has a lot of songs that haven’t been licensed yet by Pandora, which means you won’t be able to add them to your offline library or any playlists in general, which really takes away from the experience. After using it for the past month, I also realized that Pandora stations tend to favor unlicensed songs, which means you'll be hearing a lot of songs that you may like, but can't save for another listen later. Pros: The most interesting feature about Google Play Music (paid subscription) is that it has a smart recommendation system. It takes into consideration my location, and suggests music stations based on what I'm doing, the time of day, any unique scenarios like holiday weekends, etc. For example, Google Play Music will recommend a work playlist called “Working to a Beat” or offer a “Working Out”playlist when I'm at the gym -- it's an impressive feature to say the least. Google Play Music also makes it easy to upload your own personal music to its library (up to 50,000 songs!) and gives you access to YouTube Red, a $9.99/month value for free. Having the ability to play the music video (if available) of whichever song you are listening to with just one simple touch is also a nice perk. If you have a limited data plan on your smartphone or are frequently in areas without cell service, Google Play Music allows you to download individual songs or full albums so you can listen while being offline. Cons: Google Play Music doesn’t have a lyric display option like many of the other streaming services, and also does not offer a student discount. Price: Free without offline listening and radio only with occasional ads. The standard paid subscription is available at $9.99/month; $14.99/month for a family plan with the ability to add up to 5 people. 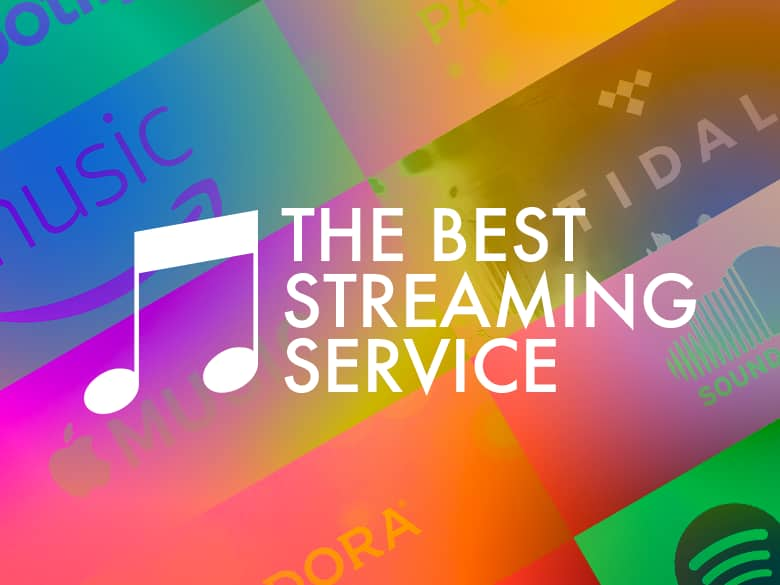 Whether you're an Apple fanatic, love discovering new music, or you just really appreciate high-quality audio, there's definitely a music streaming service tailored to your needs. But if you want the best experience for the best price, it's difficult to beat Spotify — especially if you're a student (or can swing an .edu e-mail address *hint hint*). With more than 30 million songs and incredible curated playlists, I think you'd be hard-pressed to find a better experience on the market today. Alternatively, Apple Music is a decent choice that still keeps a lot of music fans happy — it's perfect for those who can't be swayed from their beloved Apple products. That being said, Google Play Music appears to be a potential threat to other music services as it offers YouTube Red (which boasts some original content and an ad-free YouTube experience) as an added bonus to the paid service. Your current device and library ecosystem — Apple or Google — will also affect which service you use. There's absolutely no reason for an Apple product user to switch to Google's services, and vice-versa. While the other services discussed here have some great qualities, they just can't beat the value, selection, and user-experience of either Spotify or Apple Music — at least not yet. Google Play Music was added to this article in response to feedback from Slickdeals users. David Pena is a soccer lover, Star Wars fan, and Netflix binging expert. His favorite team is Real Madrid, and he plays on a team with his family in a Sunday league. David also loves Disneyland, and his favorite time to visit the theme park is during Christmas. His favorite shows to binge-watch on Netflix are Stranger Things and Mad Men.